Master Gardeners maintain information tables a the Sonoma County Fair and other selected fairs throughout the county. At these tables, Master Gardeners are able to provide unique assistance to the home gardener. Come see the UC Master Gardeners of Sonoma County Demonstration Garden at the Sonoma County Fair from August 3-13, 2017! In this year’s Master Gardener demonstration garden at the Sonoma County Fair, we are demonstrating the principles of sustainable gardening. Rain water from the roof runs down from the gutters into a dry creek bed that takes water away from the foundation and directs it to a rain garden that allows the water to percolate into the soil and recharge the aquifer. All the colorful ornamental plants in the garden are no- or low-water use plants. To increase the soil’s ability to retain moisture, we’ve covered the soil with a 3” – 4” layer of mulch. Keep your garden “green” by using materials in your garden that are permeable (like our decomposed granite patio), recyclable, and natural (like our mulch). Composting kitchen & garden waste reduces the amount of landfill and feeds microbes in the soil. It’s easy to build a compost bin similar to the one in the demonstration garden. Growing your own food is fun, and it tastes so much better than store-bought produce. Our food demonstration garden at the County Fair shows how to grow great herbs & vegetables in our climate. Check out the drip irrigation in the raised beds, maximizing watering efficiency. And lastly, to create a habitat inviting to birds and bees, we just need to add plants to attract pollinators and provide cover as well as a source of water and good nesting sites. 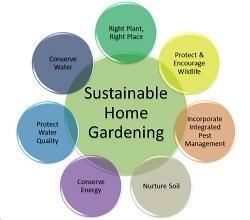 Visit our Sustainable Home Gardening web page for more information on the 7 key principles of sustainable gardening. #26 Cinco de Mayo Junior Garden, winner of a Master Gardener award plaque and $50. 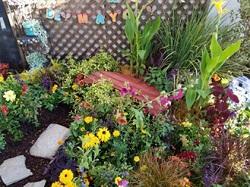 This garden demonstrated a nice overall installation and design with bright colors for the Cinco de Mayo theme. The meadow like arrangement included some low water use plants including Carex testacea, Lantana, Salvia, Gaillardia. The layout included an excellent demonstration of permeable surface with a mulched pathway leading to a wood bench. Nice job! 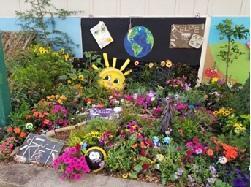 The runner-up junior garden featured Earth Day. This garden feature some sustainable practices with information signs on composting, growing food, use of mulch, and recycling materials for garden art. The garden included a good use of pollinator plants such as Yarrow, Verbena and Alyssum. Well done!